Judge Keith Gregory currently serves on the Superior Court bench, having been appointed by Governor Roy Cooper to fill the seat formerly held by Judge Donald Stephens. Prior to joining the Superior Court bench, Judge Gregory proudly served 8 years on the Wake County District Court bench, presiding over both criminal and civil court. Before becoming a judge, he gained 15 years of trial experience as a private practitioner, Assistant Public Defender, and Assistant District Attorney. Judge Gregory believes it is important to serve the people of North Carolina, his profession, and his community with integrity and honor. He is humbled to have been elected President of the North Carolina Association of District Court Judges by his peers last year. He was also elected to the Wake County Bar Association Board of Directors in 2009 and 2016, and served for 8 years on the North Carolina State Bar Continuing Legal Education Board. 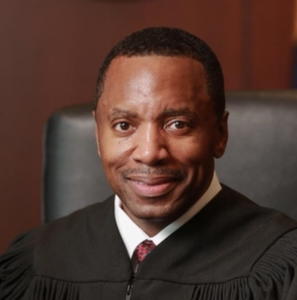 In his community Judge Gregory has served as a Board member of the Interfaith Food Shuttle and REENTRY Inc.
Judge Gregory is a past member of Mount Zion Baptist Church in Cary and is a current member of Poplar Springs Church in Garner. Judge Gregory received a Bachelor of Arts degree in Sociology from the University of Virginia in 1988 and his Juris Doctorate from North Carolina Central University in 1994. He currently lives in Cary and is a proud father of Carter, his adult son.